Starting tonight at 8pm in the Oman Auditorium at the Al Bustan Palace see's the Season Finale with the Royal Symphony Orchestra of Oman's summer concert. 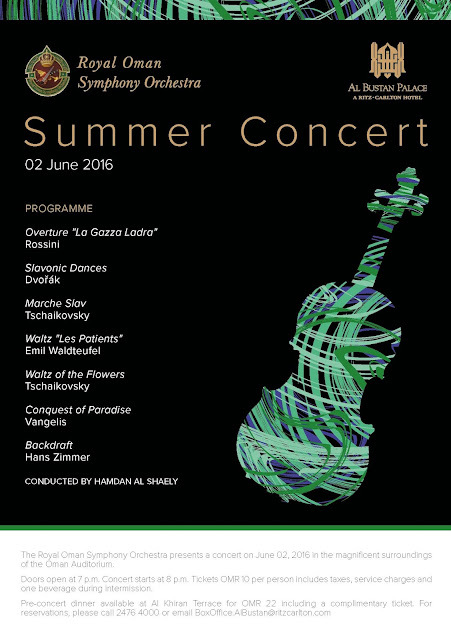 The programme is detailed in the image above and for fans of classical music, it'll be a great evening. Tickets cost RO 10 per person which includes a complimentary beverage during intermission. Make an evening of it and get dinner at the Al Khiran terrace for RO 22 which includes a complimentary ticket to the concert. The hotel has also launched it's new GCC resident rates for the rest of the summer (up until the 30th September - obviously Eid's are not included in this rate) - RO 60 including breakfast - that's a pretty good deal! "see's the Season..." seriously Sythe? I thought it was a fun play on words! I was thinking about the apostrophe. Now I'm even more worried.